Laccase, a multicopper oxidase that catalyzes the oxidation of phenols, aromatic amines, and benzenethiols, has attracted much attention in applications of organic synthesis, bioremediation, and pulp/textile bleaching. However, free laccases cannot be recycled and are easily inactivated in diverse environmental conditions. Enzyme immobilization is a promising strategy to improve stability, resistance to extreme conditions, and reusability of laccase. In this study, amino-functionalized magnetic Fe3O4 nanoparticles were synthesized for co-immobilization of 2,2,6,6-tetramethylpiperidine-1-oxyl (TEMPO) and laccase by glutaraldehyde cross-linking method. The magnetic nanoparticles were characterized with FTIR, XRD and VSM. Cyclic voltammetry was carried out to verify electrochemical behaviors of the co-immobilized laccase and TEMPO nanoparticles. When the co-immobilized laccase and TEMPO nanoparticles were used to decolorize acid fuchsin, the maximum decolorization rate of 77.41% was obtained with the ratio of TEMPO to laccase being 0.3 mM/g:120 U/g. The co-immobilized nanoparticles retained above 50% residual activity after eight cycles of operation, which presented an approach to develop a co-immobilized laccase and mediator system for potential industrial application. Laccase (benzenediol:oxygen oxidoreductase, EC 1.10.3.2) is a multicopper oxidase and widely discovers from many plants, insects, and fungi (Mate and Alcalde 2017). It contains four copper atoms in its catalytic center and catalyzes the oxidation of phenols, polyphenols, polyamines, and benzenethiols by reducing molecular oxygen to water (Chao et al. 2017; Su et al. 2018; Mate and Alcalde 2015). In the past years, laccases have attracted much attention and been used in various applications, including organic synthesis, bioremediation, pulp bleaching, and biofuel production (Jeon and Chang 2013; Kudanga and Le Roes-Hill 2014). However, free laccases cannot be recycled and are easily inactivated in diverse environmental conditions, which limit their further use in industry. Immobilization is a promising strategy to improve stability, resistance to extreme conditions, and reusability of laccase (Ba and Kumar 2017). So far, laccase has been successfully immobilized with several methods, including entrapment, encapsulation, adsorption, covalent binding, and self-immobilization (Ba et al. 2013; Fernández-Fernández et al. 2013). Although the stability of the immobilized laccase against temperature, organic solvents, pH, storage, and operation has been greatly improved, the activity recovery is not always satisfactory. In addition, the ability of laccase to catalyze recalcitrant compounds is limited for its low redox potential. This can be overcome by establishing laccase mediator system (LMS) (Jeon and Chang 2013; Mogharabi and Faramarzi 2014). 2,2′-Azino-bis-(3-ethylbenzothiazoline)-6-sulfonic acid (ABTS), 1-hydroxybenzo-triazole (HBT), and 2,2,6,6-tetramethylpiperidine-1-oxyl (TEMPO) are usually used as mediators to transfer electrons from substrate to laccase. However, these mediators are usually expensive and difficult to recover from reaction mixture, which hampers the applications of LMS. Attempts have been made to immobilize mediators to recycle them. Machado et al. (2015) reported the immobilization of 4-hydroxy-TEMPO on mesoporous silica using 1,4-diisocyanatobutane as the linking agent. Tucker-Schwartz et al. (2010) employed iron oxide (Fe3O4) superparamagnetic nanoparticles to immobilize TEMPO with strong metal-oxide-chelating phosphonates and azide/alkyne “click” chemistry. The resultant TEMPO-coated nanoparticles, with good TEMPO loading, can be used to efficiently catalyze the oxidation of a wide range of alcohols. In recent years, magnetic nanoparticles have attracted widespread attention because of their large surface areas, nontoxicity, magnetic properties, and biocompatibility. As a support material, magnetic nanoparticles can be rapidly separated from solution by the application of an external magnetic field rather than by centrifugation, and they have been deemed to be efficient carriers for enzyme immobilization (Ansari and Husain 2012; Can et al. 2009; Torres-Salas et al. 2011; Xin et al. 2010). Ren et al. have successfully immobilized lipase onto magnetic iron oxide nanoparticles via a biomimetic coating, which significantly improved its thermal and pH stability (Ren et al. 2011). Aminated magnetic mesoporous silica, (Fe3O4@MSS)-NH2, was synthesized to immobilize laccase using covalent cross-linking methods (Huang et al. 2014). 2,4-Dichlorophenol was degraded by the immobilized laccase with a removal efficiency of 88%, and 61.5% activity was remained after five cycles of operation. Zheng et al. (2012) prepared magnetic silica composite particles functionalized with 3-aminopropyltriethoxysilane (APTES) for laccase immobilization with the activity recovery of 83.9%. In the present study, we reported a system that co-immobilizes laccase and mediator, allowing the simultaneous reuse of both laccase and the mediator. Magnetic nanoparticles were successfully prepared and modified with 3-amino-propyltriethoxysilane (APTES) to introduce abundant amine groups onto their surfaces. Then, laccase and 4-amino-TEMPO were efficiently co-immobilized onto the amino-functionalized Fe3O4 nanoparticles, using glutaraldehyde as the cross-linking agent. Finally, the decolorization of acid fuchsin, a triphenylmethane dye, by the co-immobilized laccase mediator system was conducted to evaluate the stability and efficiency for its potential future applications. Laccase (EC 1.10.3.2 from Trametes versicolor, 13.6U/mg) and ABTS were purchased from Sigma-Aldrich Co. Ltd. (St. Louis, MO, USA). APTES, 4-amino-TEMPO, glutaraldehyde (25%, v/v, aqueous solution), Coomassie Brilliant Blue, bovine serum albumin, acid fuchsin and polyvinyl alcohol (PVA) with 1750 ± 50 of polymerization and 98% of degree of hydrolysis were from Aladdin Co. Ltd (Shanghai, China). All other chemicals were of analytical grade unless otherwise mentioned. Magnetic Fe3O4 nanoparticles were synthesized with the co-precipitation method and further modified with amino groups according to the method reported previously (Yamaura et al. 2004). First, 1.04 g of FeCl3·6H2O and 0.4 g of FeCl2·4H2O were dissolved in 10 mL deionized water, and 25 mL NaOH solution (3.0 M) was added to the mixture with vigorously stirring at 70 °C. After 30 min reaction, by applying an external magnetic field, the resultant Fe3O4 nanoparticles were collected and washed several times with deionized water until pH 7.0. 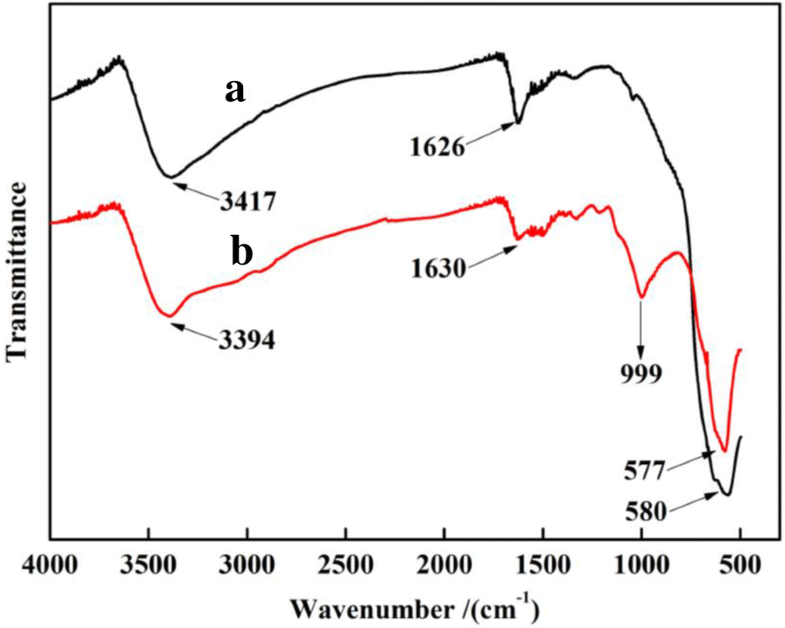 The FTIR spectra of the nanoparticles were recorded on a Fourier transformed infrared spectroscopy (Thermo, USA). The XRD spectra of the nanoparticles were analyzed with D8 Advance XRD (Bruker, Switzerland). VSM (EV7, ADE Technologies) was used to record the magnetic susceptibility of the nanoparticles. The procedure of co-immobilization of laccase and TEMPO onto amino-functionalized Fe3O4 nanoparticles was briefly described as follows (Scheme 1). The nanoparticles were modified with APTES via a silanization reaction to form the amino-functionalized Fe3O4 nanoparticles (Reza et al. 2010). 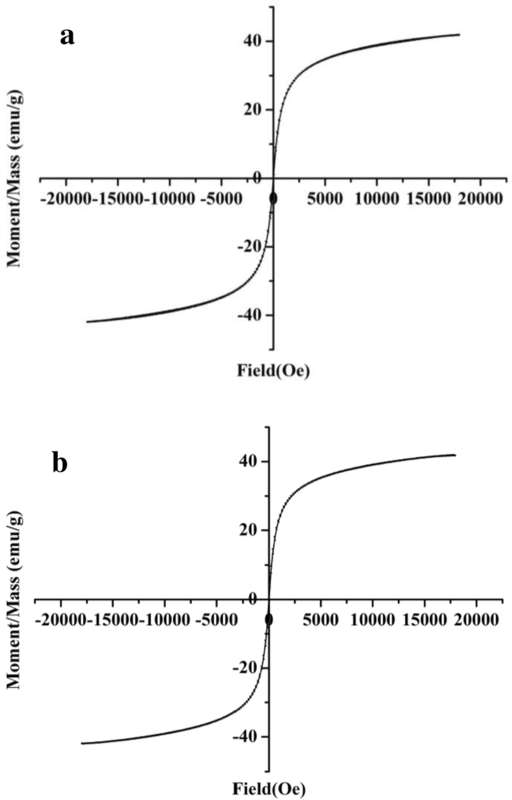 The procedure involved the addition of 40 mL of 10% APTES in water to the magnetite suspension with glycerol (pH 4.0, adjusted with glacial acetic acid), and heating at 90 °C for 3.0 h with continuous stirring. The resultant amino-functionalized Fe3O4 nanoparticles were washed three times with deionized water, dried under vacuum, and stored before use. Then, 100 mg of nanoparticles was suspended in 10 mL of 15% glutaraldehyde solution in pH 6.0, 0.1 M acetate buffer, and the suspension was kept under mild stirring at 25 °C for 12 h. The suspension was collected and washed three times with deionized water and stored under 4 °C. Thereafter, 100 mg of nanoparticles activated with glutaraldehyde, as described above, was added to 10 mL of acetate buffer (0.1 M, pH 4.5) containing a certain amount of laccase and 4-amino-TEMPO. The suspension was shaken at 120 rpm for several hours to produce nanoparticles carrying co-immobilized laccase and TEMPO. The resultant nanoparticles were washed several times with acetate buffer and collected to store under 4 °C. The amount of TEMPO attached onto the nanoparticles was measured spectrophotometrically, monitoring the changes in the 4-amino-TEMPO concentration before and after the reaction as the changes in the absorbance at a wavelength of 230 nm (A230) with a UV–Vis spectrophotometer (Thermo/GENESYS 10S, USA). The modified glassy carbon (GC) electrodes were used as a working electrode with an Ag/AgCl as reference electrode and a Pt wire as a counter electrode, respectively. 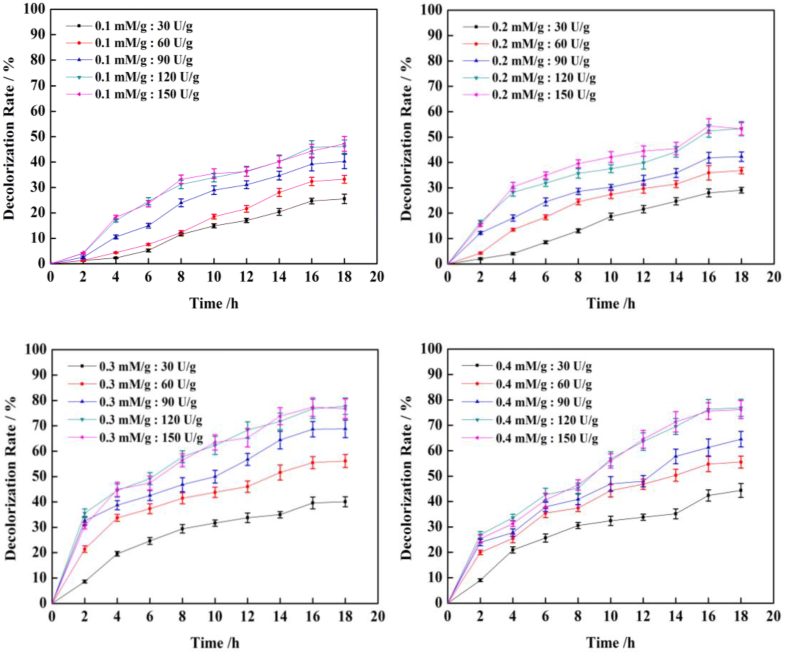 The glassy carbon electrodes were modified as follows: 5 mg of immobilized laccase and co-immobilized laccase and TEMPO was mixed with 100 μL of 0.3% PVA solution to produce PVA/Fe3O4-Laccase and PVA/Fe3O4-Laccase–TEMPO colloids, respectively. The surface of GC electrodes (5 mm in diameter) was polished thoroughly with Al2O3 (0.05 μm) by rinsing thoroughly with distilled water. Then, 10 μL PVA/Fe3O4-Laccase and PVA/Fe3O4-Laccase–TEMPO colloids solutions were dropped on the surface of pretreated electrodes and allowed to dry under ambient condition at 4 °C, respectively. After the modified electrodes were rinsed with distilled water twice or thrice, PVA/Fe3O4-Laccase and PVA/Fe3O4-Laccase–TEMPO modified GC electrodes were obtained. 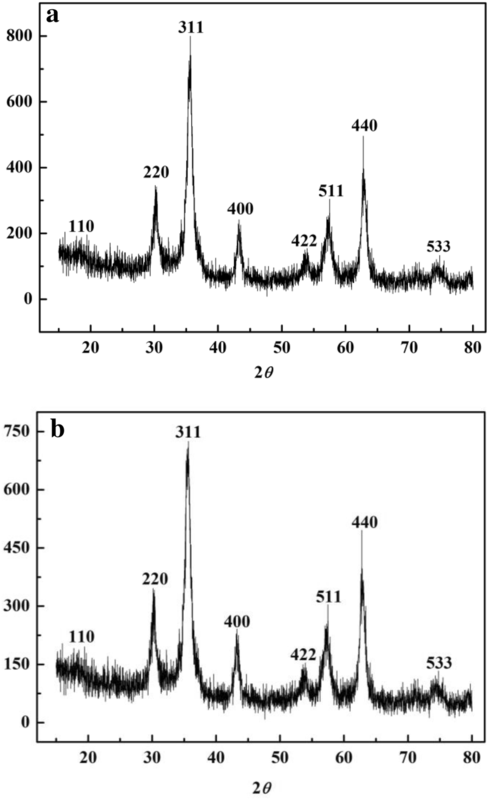 Experiments of cyclic voltammetry were run in a three-electrode system (PGSTAT302N, Metrohm, Switzerland) at a scan rate of 50 mV/s in pH 4.5 acetate butter solution containing 0.1 mM catechol. where A0 is the initial A540 and At is A540 after various time intervals. The nanoparticles used for dye decolorization were run for 10 cycles to test their reusability. At the end of each cycle, the nanoparticles were separated magnetically and washed several times with acetate buffer (0.1 M), then the next cycle was commenced. where Ai is the activity (units) of the immobilized laccase and Af is the activity (units) of the same amount of free laccase immobilized on the support. The FTIR spectra of Fe3O4 nanoparticles and amino-functionalized Fe3O4 nanoparticles were determined to confirm the presence of terminal amino group on the functionalized nanoparticles. The peaks at 580, 3417, and 1626 cm−1 in Fig. 1a were assigned to Fe–O stretching vibration, O–H stretching, and O–H deformation, respectively (Alba et al. 1996; Lü et al. 2003; Peng et al. 2004). The significant peak appeared at 999 cm−1 in Fig. 1b, which was corresponded with Si–O stretching, was related to the silanization reaction (Hu et al. 2009). The strong absorption band at 3394 cm−1 in Fig. 1b was probably attributable to the free amino groups and overlapped by the O–H stretching vibration (Hu et al. 2015). Therefore, it can be speculated that amine groups have been successfully introduced onto the surfaces of the Fe3O4 nanoparticles by silanization reaction. The XRD spectra of magnetic Fe3O4 nanoparticles and amino-functionalized Fe3O4 nanoparticles are shown in Fig. 2. The characteristic peaks of the Fe3O4 nanoparticles and amino-functionalized Fe3O4 nanoparticles were distinguishable and consistent with the standard pattern for Fe3O4 (Rocktotpal et al. 2009), which indicated that the crystalline structure was not altered by particle modification. As shown in Fig. 3, the hysteresis loop of the magnetic Fe3O4 nanoparticles and amino-functionalized Fe3O4 nanoparticles revealed a ferromagnetic behavior and the remanence and coercive force was very small, almost near to zero, closing to superparamagnetism with the saturated magnetic intensity value of 41.81 and 41.77 emu/g, respectively. Cyclic voltammetry was carried out to study the electrochemical behaviors of PVA/Fe3O4-Laccase and PVA/Fe3O4-Laccase–TEMPO modified GC electrodes (Fig. 4). They both had redox behaviors in pH 4.5 acetate buffer in the presence of 0.1 mM catechol. 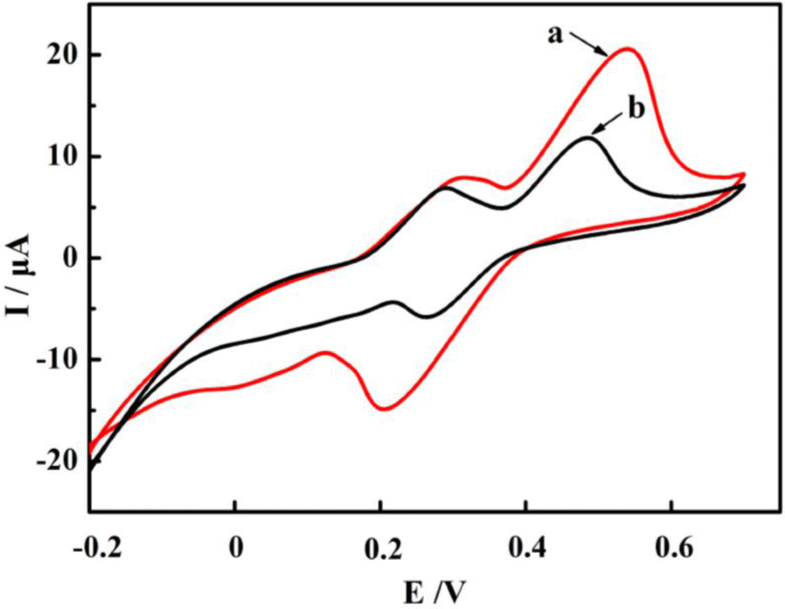 However, the anodic peak potential of PVA/Fe3O4-Laccase–TEMPO modified GC electrode shifted to a more positive value and the cathodic peak potential shifted to a lower negative direction. Moreover, the catalytic current of PVA/Fe3O4-Laccase–TEMPO modified GC electrode was larger than PVA/Fe3O4-Laccase modified GC electrode. These demonstrated that TEMPO immobilized on Fe3O4 played an important role during the electron transfer between electrode and immobilized enzyme, which indicated that TEMPO was successfully immobilized on carriers. It might lead electrons of the substrate to the redox centers of laccase and improve the catalytic activity of laccase (Wei et al. 2008; Zhao et al. 2002). As can be observed in Fig. 5, acid fuchsin cannot be decolorized well by the immobilized laccase or immobilized TEMPO separately. However, we found that the co-immobilized laccase and TEMPO showed a great capacity for decolorization of acid fuchsin, which showed a 68.8% decolorization rate after 16 h. Results further confirmed that the laccase and TEMPO had been successfully co-immobilized onto the magnetic nanoparticles. The possible reason why the immobilized laccase or immobilized TEMPO cannot decolorize acid fuchsin well is due to the substrate bearing a large structure or high redox potential. While in the case of the co-immobilized laccase and TEMPO, this limitation had been overcome with the addition of mediator TEMPO. TEMPO can act as an intermediate substrate for the laccase to react with acid fuchsin at a high redox potential oxidized radical form (Riva 2006). The investigations were conducted with various ratios of TEMPO to laccase to achieve the co-immobilization and the resulting co-immobilized beads were characterized by decolorizing acid fuchsin. The amount of laccase and TEMPO immobilized onto the support played a decisive role in the decolorization of acid fuchsin. TEMPO can be oxidized to stable radicals by laccase, oxidizing the dye molecules, which are not a natural substrate of laccase. The N–OH functionality of the mediator is related to the increase in dye decolorization by LMS system (Claus et al. 2002). As shown in Fig. 6, the decolorization rate of acid fuchsin increased with the rise of the amount of laccase and TEMPO. The maximum decolorization rate of 77.41% was obtained when the ratio of TEMPO to laccase was 0.3 mM/g:120 U/g. However, excess TEMPO did not improve the decolorization of acid fuchsin by co-immobilized laccase and TEMPO. This is probably because excess mediator would produce large amounts of free radicals, which might harm the enzyme and, thus, hinder decolorization (Mirzadeh et al. 2014). 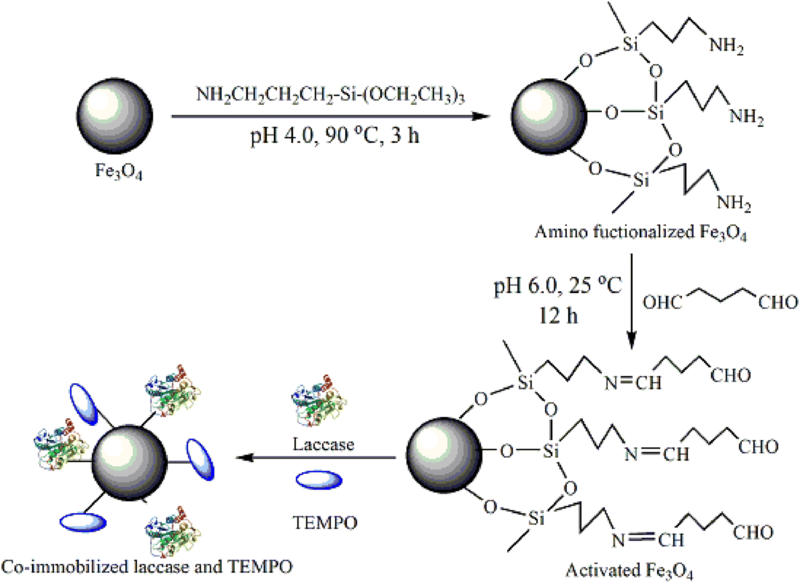 The reusability of the co-immobilized laccase and TEMPO onto Fe3O4 nanoparticles was also investigated (Fig. 7). 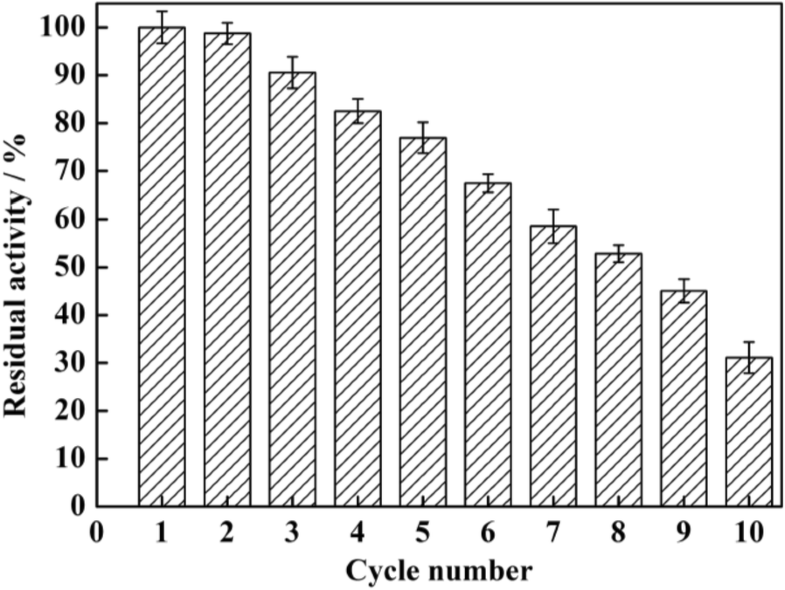 As the number of repeated cycles increased, the decolorization rate of acid fuchsin by the co-immobilized laccase and TEMPO decreased gradually. 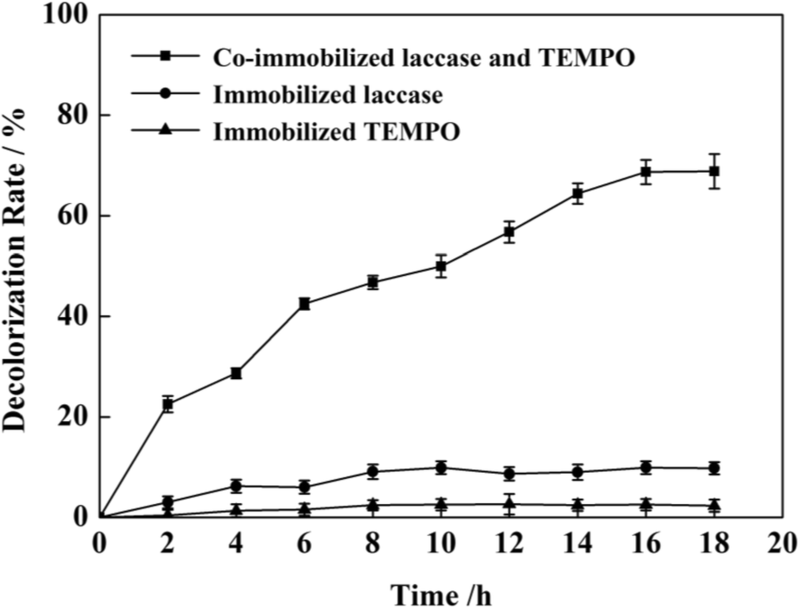 It is probable that the immobilized laccase and TEMPO fell off the nanoparticles or that a proportion of the laccase molecules was inactivated during the cycling process. After the particles were used eight times repeatedly, the co-immobilized nanoparticles retained above 50% residual activity. In summary, amino-functionalized magnetic Fe3O4 nanoparticles were prepared successfully by modifying magnetic nanoparticles to carry abundant amine groups on their surfaces. Laccase and 4-amino-TEMPO were co-immobilized onto the amino-functionalized magnetic Fe3O4 nanoparticles and used to decolorize acid fuchsin. The catalytic current of Fe3O4/PVA/Lac–TEMPO GC electrode is larger than Fe3O4/PVA/Lac GC electrode, which indicated that TEMPO was successfully immobilized onto carriers. When the ratio of TEMPO to laccase was 0.3 mM/g:120 U/g on the co-immobilized laccase and TEMPO nanoparticles, the maximum decolorization rate of acid fuchsin was 77.41%. Additionally, the co-immobilized nanoparticles retained above 50% residual activity after eight cycles of operation. This study offers a feasible approach to establish a co-immobilized laccase and mediator system, which could be useful in industrial applications. HJ and PW designed the experiments, ZG and YY conducted most of the experiments, JZ analyzed the data, YX and XY wrote the manuscript, MJ, FC and HZ provided advices on the experimental design and language. All authors read and approved the final manuscript. The authors have read and agreed the ethics for publishing the manuscript. This research was financially supported by NSFC (21406114 and 20906048), the Natural Science Foundation of Jiangsu Higher Education Institutions of China (14KJB530002), the Science Foundation for Postdoctoral Research from Jiangsu Province of China (1401009A), the Jiangsu Synergetic Innovation Center for Advanced Bio-Manufacture, PCSIRT (IRT_14R28), and PAPD.